Our Little Conversations show at The Cultch. Real. Honest. Sad. Funny. Whether they’re in-depth talks or brief exchanges on the street, conversations are how we connect with the world. Through her music, blue dirt girl unearths, unbuttons and examines all of her conversations—from her working and writing sessions with her bandmates to the regular Friday morning discussions with the women behind Thinking Ship poems, and Sob Stories podcasts to the spontaneous chats she has with the people she meets throughout the day. Out of these little conversations come inspiration and collaboration. 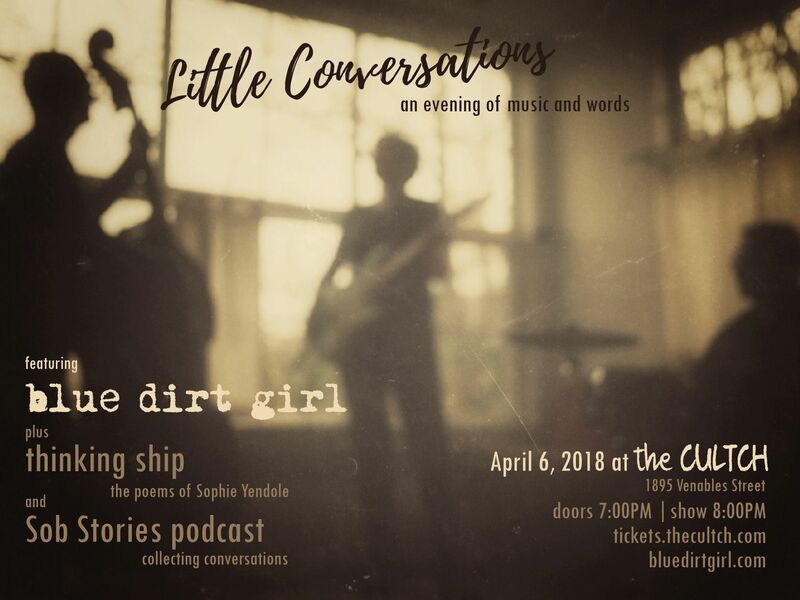 On April 6th you have the rare opportunity to listen in on the conversation between the music of blue dirt girl and the poems of Thinking Ship; take a moment to engage with Sob Stories who will be collecting conversations for the podcast in the Founders’ Lounge. Start a conversation . . . it’ll change your day. Special guest vocalist, ukulele player Moira Chicilo will be sitting in on various songs through the evening. Moira, my cousin, and I wrote songs through various conversations about the strong, intriguing women in our family lineage. I am very honoured to share the stage with all these fiercely talented indie musicians/poet/artists. I do hope you will come out and both listen and start some conversations of your own on April 6th! The Cultch 1895 Venables Vancouver B.C.